One sip of this fine punch and you will be transported away to magical lands unknown. A flavor like this seems to bring about a feeling of whimsy and wonder with its delicious combination of charming flavors that are balanced, fun and inspiring. As soon as you bring this blend into your life you will be adding in a way for you to be able to transport yourself back to those summer days where it felt like nothing could make them any better. The perfect weather, the perfect company and some delicious food all in one place, giving you everything that you need to make for one of those unforgettable moments. Relive that in such a realistic way with this juice that is going to be so true to form that you might be able to feel that beautifully manicured grass in between your toes and hear the sounds of some party-ready music in your ears. It is going to be so awesome to have this juice in your repertoire so that you can access these positive vibes and fond memories in such an easy and enjoyable sort of way that is going to capture your heart. TWST Salt E Liquid makes some of the most scrumptious and inspiring blends that you will ever come across with a huge focus being put onto making fruit flavored juices that are bright, bold and always delectable. You're not going to have to ever question the quality that these blends are able to provide and whenever you can bring them into your life, you will be in for something really good. Iced Pink Punch takes a tart, tangy lemonade base that has some sweet, summery strawberry syrup mixed in and just the right amount of menthol to mimic that all important ice. 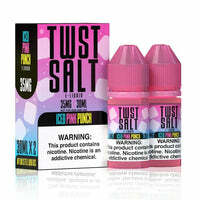 Iced Pink Punch - TWST Salt E Liquid has a rating of 4.0 stars based on 1 reviews.